The law on medical marijuana manufacture and distribution is highly complex and in flux in many states; however, under federal regulations, manufacturing and distributing medical marijuana remains illegal. Many states are in the process of creating medical marijuana licensing laws or have developed an initial licensing process. Some of the states with medical marijuana licensing have limited the amount of permits that will be issued at a given time creating great competition for the few spots. For example, in Minnesota, only two companies were selected to manufacture medical marijuana for the entire state. In New York, only five companies will be selected to manufacture and dispense medical marijuana. In the states where medical marijuana dispensaries are legal, they are often licensed by both state and local governments. The requirements can be substantial and involve an arduous review processes. Colorado’s Department of Revenue licenses medical and retail marijuana, as well as its manufacture. Applicants for a state license must apply in person, by appointment only. If an applicant wants to operate in the city of Denver Colorado, they needed to apply before a specified date, or they need to purchase a previously licensed medical marijuana business that operated in good standing. The application process varies by jurisdiction but usually requires financial disclosures, fingerprinting / background checks, and non-refundable application fees generally ranging from $1000 - $5000 with license fees averaging well over $10,000. Conversely, Montana has a relatively simple registration process for Marijuana Providers and Marijuana Infused Products Providers. The application fee is $50 and supporting documentation include fingerprint cards and proof of Montana residency for each individual provider. 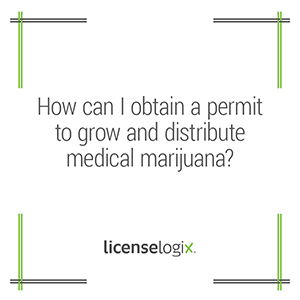 With licensing rules and regulations changing at such a rapid pace, obtaining a permit for growing and distributing medical marijuana can be a difficult process. LicenseLogix can determine what the licensing requirements are and assist you in getting there. Contact us today to get started.